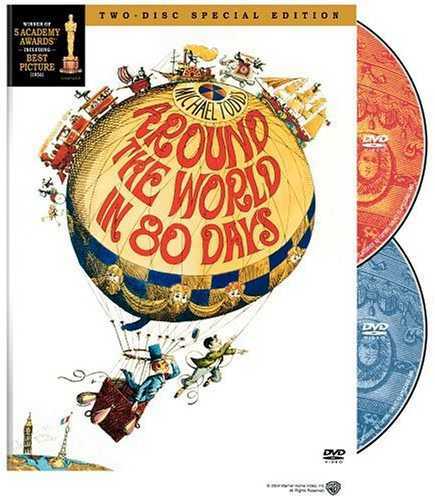 The original 1956 film adaption of Jules Verne’s novel, Around the World in 80 Days , is a great family night movie for kids of all ages! This adventure starring David Niven, takes his character, Phileas Fogg, on trains, steamships, taxis, and a hot air balloon all around the world. Children will be introduced to European culture, such as the bullfight filmed in Madrid; locations such as Gare du Nord in Paris and Hyde Park in London; and other scenes filmed in Spain, Paris, and London - not to mention India, Japan, Hong Kong, Thailand, and Pakistan. There is a 2004 remake starring Jackie Chan and Steve Coogan which I haven't seen. It's rated PG. It's probably really good too, I don't know, but we just like to watch the old classics once in awhile with the kids! Oh I LOOOOOVE that movie! And it's SOOO appropriate for my 'round the world' adventure! Pop downunder for a visit and check it out!! PS One day I'll see the new version - the one I loved was the original! !